From teaching the shed to competition shedding. 1 hour 40 minutes. The only DVD of its kind. This DVD has received excellent reviews. Whether you plan on competing or not, this DVD will give you tips on handling your dog on stock which will help in everyday work. 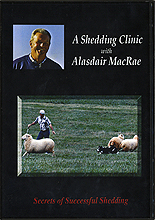 Alasdair MacRae is one of the world's top handlers and he shares valuable tips and techniques throughout the DVD.